It is possible that no one else has spent as much intimate time with the Sarjeant Collection as photographer Richard Wotton. He has worked amongst the collection for thirty-one years, documenting the artworks for catalogues, exhibitions, the media, archival records and, more recently, for Explore the Collection, the prize-winning online portal through which the public can digitally access the entire collection. Photographing the nationally significant Sarjeant Collection demands a special touch and an understanding of how to handle some of the country’s most exceptional artworks. “It’s been a real privilege to spend so much hands-on time with thousands of artworks in different media,” he says modestly. 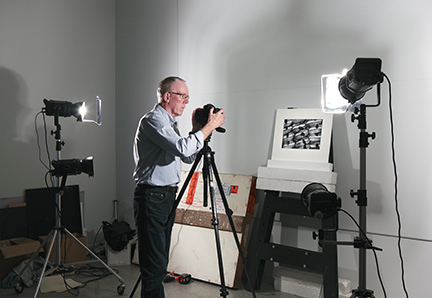 On Wednesday, 1 August, Richard Wotton will close his studio door for the last time, retiring from one of the most dynamic roles at the Sarjeant Gallery – gallery photographer. Wotton leaves the Sarjeant to relax and pursue his own work, and no doubt will be a regular Sarjeant visitor. Staff will farewell him today at a morning tea gathering. Used to a life behind the camera, Wotton’s departure will be a characteristically low-key affair. Wotton’s connection with the Sarjeant Gallery extends beyond the artworks. In 1986, the first Tylee Cottage artist-in-residence was photographer Laurence Aberhart, and he and Wotton shared the Sarjeant Gallery’s basement photographic darkroom for five months. Aberhart and painter Mervyn Williams stand out as inspirational artists for Wotton. “Both are masters of their craft and have an uncompromising approach to their work.” One could say Wotton has adapted that uncompromising approach to his work, demanding and delivering exceptional results for the Gallery. Wotton recently exhibited an exceptionally beautiful black and white photograph of his granddaughter Amelia in the 2018 Whanganui Arts Review at the beginning of this year. The image displays both an intricate delicacy and an evolving steely strength just below the surface – much like the man himself.